Today I’m sharing our best Cut-Out Sugar Cookie Recipe! Everybody needs a great sugar cookie recipe that’s easy to make, tastes fantastic, and one that holds its shape when baked. We’ve got that perfect recipe right here! I’ve taken my mom’s old sugar cookie recipe and tweaked it into the BEST fool-proof sugar cookie recipe ever. Once you try this recipe, you’ll trust it always. I’m not an expert cookie decorator, but I am an expert cut-out sugar cookie maker. 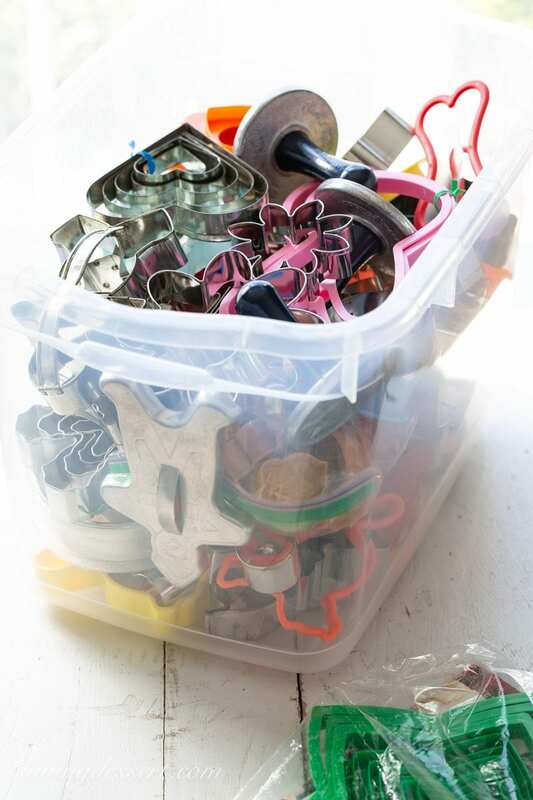 You can probably tell from this obsessive cookie cutter collection that I’ve made a few cut-out sugar cookies in my life. Some of these cutters were handed down from my mom, and others have been gifted to me from family and friends. I pick up a new one from time to time, but may need a bigger bucket if this keeps up! I don’t even want to tell you how many years I’ve been making cut-out cookies…or you may think I’m getting really old. Let’s just say I’ve been making sugar cookies since I was a young girl helping my mom in the kitchen. Mom always made sugar cookies during the holidays in the shapes of Christmas trees, stars, Santa Claus, a snowman and bells. Once I had kids of my own, we started our own annual tradition of making and decorating sugar cookies during the holidays. Then we started making sugar cookies for other holidays such as Halloween, Easter, St. Patrick’s Day, Valentine’s Day and even the start of baseball season! I’ve always been the cookie baker and the kids and my husband were the decorators. We often have massive amounts of sprinkles at our house and plenty of willing little ones around to help decorate cookies for all the seasons. I’ve always loved mom’s sugar cookie recipe but when baked, the cookies spread just a little more than I wanted. Let’s face it, if you’re going to make cut-out sugar cookies they need to keep their shape. After many, many years, I wanted to see if I could tweak Mom’s recipe enough to fix the minor spreading issue. First, I knew I had to reduce the amount of eggs in the recipe. Mom’s original recipe called for three eggs which also made it hard to cut the recipe in half for smaller batches. I reduced the recipe to two eggs and added two ounces of cream cheese to replace the third egg. Now I was able to easily cut the recipe in half, which I have done in the printable recipe below. Since I always use unsalted butter when baking, I added salt to the dough as well. Finally, I substituted a little almond extract in place of some of the vanilla. After making this re-worked recipe several times, I added a bit more flour and immediately knew this was the one. 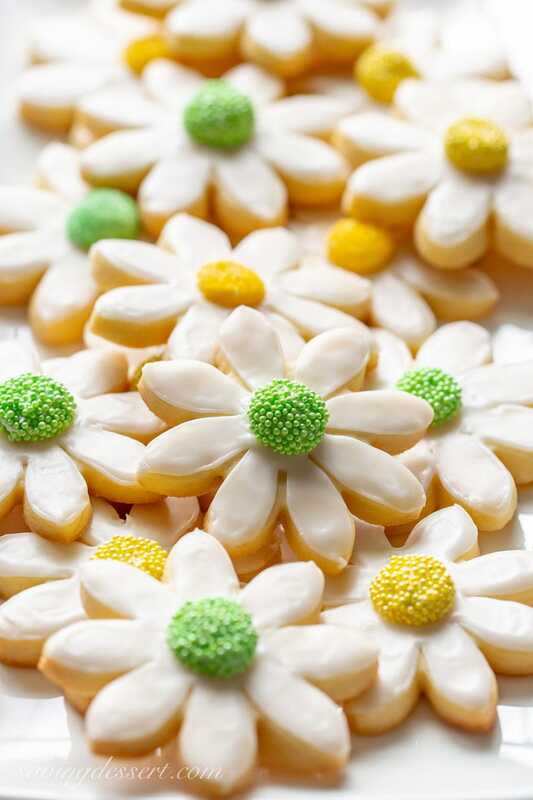 These cookies are not stiff or hard to eat, and won’t soften too much after they’re decorated. My family is not crazy about the taste of Royal icing, so we use a simple powdered sugar glaze to decorate. I usually make this glaze in very small batches adding more sugar if needed to thicken, or extra boiling water to thin. Once the desired consistency is reached, I pipe a thicker line around the edges of the cookie to create an outline. The remaining glaze is thinned slightly with hot water, then pipped to fill in the decoration. When making these cookies for the kids to decorate, I usually just spread it on with a knife then hand them off to be sprinkled. Our family likes this glaze because it’s just enough icing to add sweetness without being thick and overpowering. It also dries beautifully preserving the decoration – bonus! As mentioned above, I’m not much of a cookie decorator, but really enjoy making these cut-out sugar cookies! The dough is so easy to work with and won’t disappoint. Rolling the dough to 1/4-inch is my favorite size. It’s thick enough for a good bite, and not too thin to be fragile. For a fun treat, also roll the dough a little thinner, cut into small rounds, bake and then spread with a heaping spoonful of Nutella. Sandwich with another cookie on top for a delicious Nutella sandwich cookie – so good! 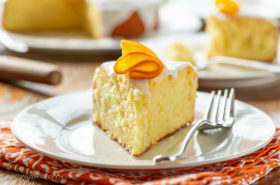 Substitute additional vanilla for the almond extract if desired. 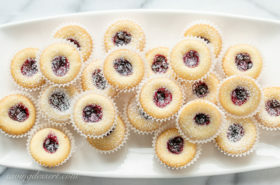 Vanilla beans or vanilla bean paste is also great in these cookies. I always use Land-O-Lakes unsalted butter when baking. Moist content can vary between butter brands. LOL is my favorite! When rolling out the cookie dough if it starts to split or crack, it’s just a little too cold. Let it rest another minute and try again. After rolling scraps a few times the extras may become a little too soft to use. Place the scraps of dough on a plate in the refrigerator for a few minutes before rolling again. Do not put unbaked cookies on a hot cookie sheet until ready to bake. It will cause them to spread. I love using a rimless baking sheet so I can slide parchment paper on and off the pan. DO NOT OVER-BAKE! The bottoms should be lightly browned and just starting to show color around the edges. Baking time will vary depending on the size and width of the cookies. Baked, cooled cookies can be frozen for up to 3 months. I’ve even thawed and then refroze plain unfrosted cookies with good results. GLAZE: For a simple glaze we use powdered sugar, a drop or two of vanilla and boiling water. Mix until smooth and spread on the baked and cooled cookies. Add more sugar or water as needed for desired consistency. I make this in small batches as it dries quickly. For the flower head I used a small batch of Royal Icing piped into mounds then covered in nonpareils and sprinkles. Wilton makes a meringue powder with instructions for Royal Icing that’s very easy. No egg whites needed! You can easily double the recipe and cut out different shaped cookies for the current and the next holiday. Make Christmas cookies and Valentine’s hearts at the same time. Freeze the hearts for later! This brilliant rolling pin makes it easy to roll out perfectly even dough every time. Whether you want 1/4-inch thick cookies or 1/16-inch thick pie pastry, this simple tool takes the guesswork out of working with dough. A great tool for the beginner baker or the seasoned baking professional! CLICK on the photo for more information from Amazon. Washable plastic screws hold the rings in place; hand-wash for best results. In a large mixing bowl beat butter and cream cheese together with an electric mixer until well blended. Add the sugar and beat until light and fluffy. Add the egg, vanilla and almond extract and beat until combined. In a small bowl whisk together 2 3/4 cup of the flour, the baking powder and salt. Add half the flour mixture to the butter and sugar and blend on low until incorporated. Add the final half of the flour mixture and beat until a soft dough forms. Add up to 1/4 cup additional flour if needed, 1-tablespoon at a time until the dough is soft and no longer sticky. For best results, do not exceed a total of 3 cups of flour. Gather the dough into a ball and cut in half. Press one half of the dough into a thick disc and wrap in a large piece of plastic wrap. Repeat with the remaining half of the dough. Refrigerate the two discs for at least 8 hours, or up to two days. When ready to bake, remove one disc of cookie dough from the refrigerator and allow it rest at room temperature for 15-20 minutes for easier rolling. Preheat oven to 350F. Line 2 baking sheets with parchment paper and set aside. Roll out the dough on a well floured, clean work surface to 1/4-inch thick. 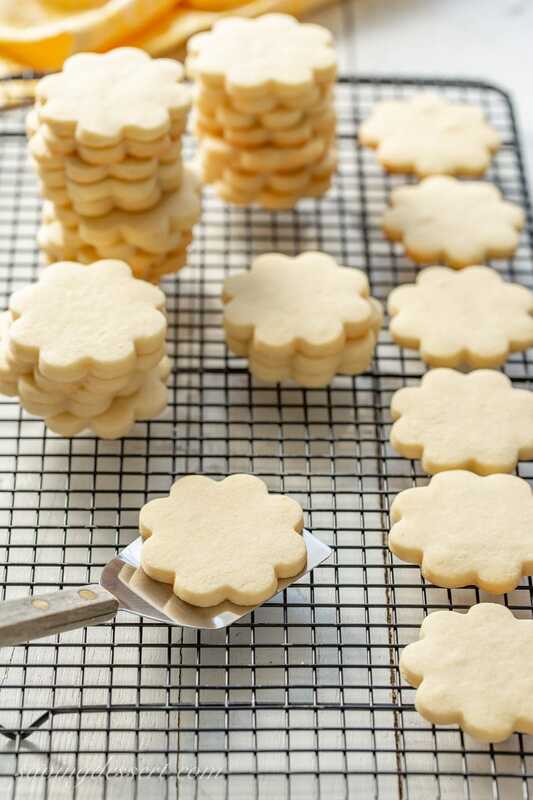 Using a cookie cutter, cut the dough into the desired shapes and place the cookies 2-inches apart on a cool baking pan. Repeat until the pan is full. Bake for 8 to 12 minutes (depending on the size and thickness of the cookies) or until lightly browned around the edges and bottom. For best results, do not over-bake! Cool on the pan for 3-4 minutes then remove to a wire rack to cool completely. 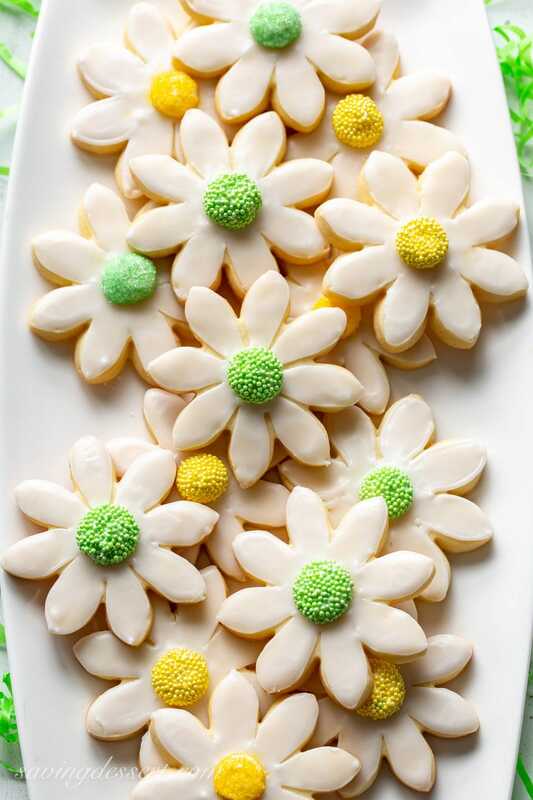 Frost the cookies with your favorite glaze, royal icing or buttercream. Substitute additional vanilla for the almond extract if desired. Vanilla bean paste is also great in these cookies. After rolling scraps a few times, the extras may become a little too soft to use. Place the scraps of dough in the refrigerator for a few minutes before rolling again. Do not put unbaked cookies on a hot cookie sheet until ready to bake. It will cause them to spread. DO NOT OVER-BAKE! The bottoms should be lightly browned and just starting to show color around the edges. Baking time will vary depending on the size and width of the cookies. Baked, cooled cookies can be frozen for up to 3 months. I’ve even thawed and refrozen plain unfrosted cookies with good results. GLAZE: For a simple glaze we use powdered sugar, a drop or two of vanilla and boiling water. Mix until smooth and spread on cooled cookies. Add more sugar or water as needed for desired thickness. I make this in small batches as it dries quickly. 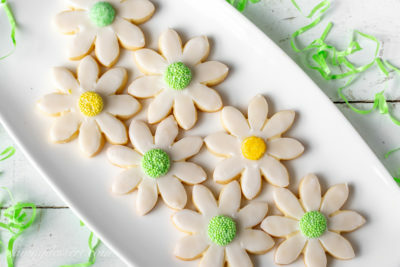 For the flower head I used a small batch of Royal Icing piped into mounds then quickly covered in nonpareils or sprinkles. Wilton makes a meringue powder with instructions for Royal Icing on the container that is very easy. 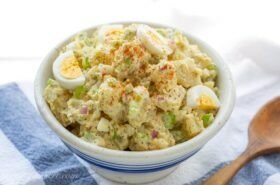 No egg whites needed! Looking for more classic cookie recipes? 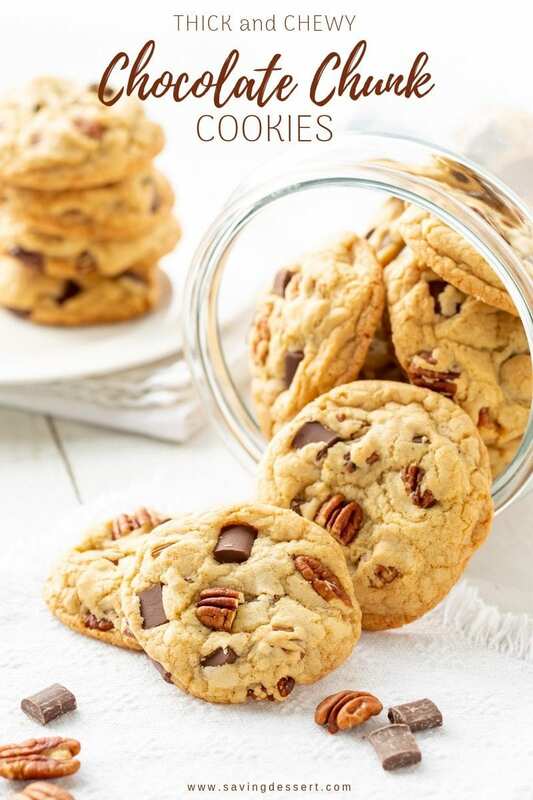 Try our Thick and Chewy Chocolate Chunk Cookies with toasted pecans. These delicious jumbo-sized cookies rival any you might find in a gourmet bake shop! Click HERE to get the recipe for Thick and Chewy Chocolate Chunk Cookies. These Chocolate Crinkle Cookies practically make me swoon! They’re thick, puffy and soft with a deep, rich chocolaty flavor, and they’re so darn pretty too. These are no less than chocolate-cookie-perfection and great served any time of the year. 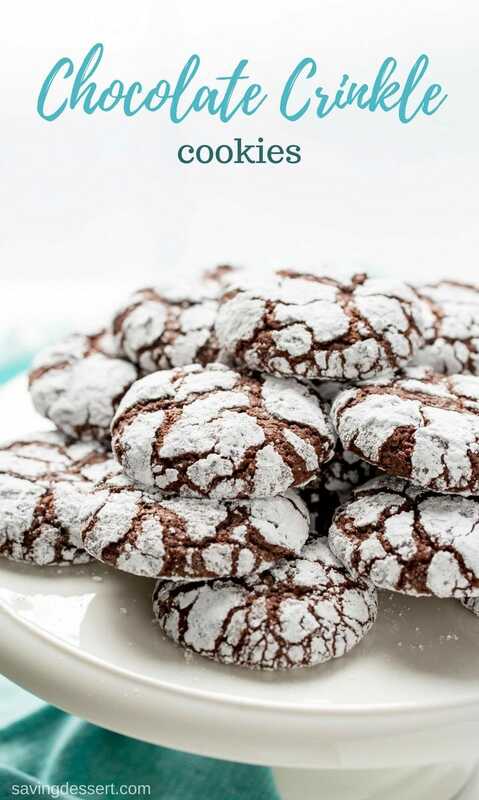 Click HERE to get the recipe for Chocolate Crinkle Cookies. White Chocolate Macadamia Nut Cookies with Coconut – Delicious jumbo-sized thick and chewy cookies that will be the shining star of the dessert tray! 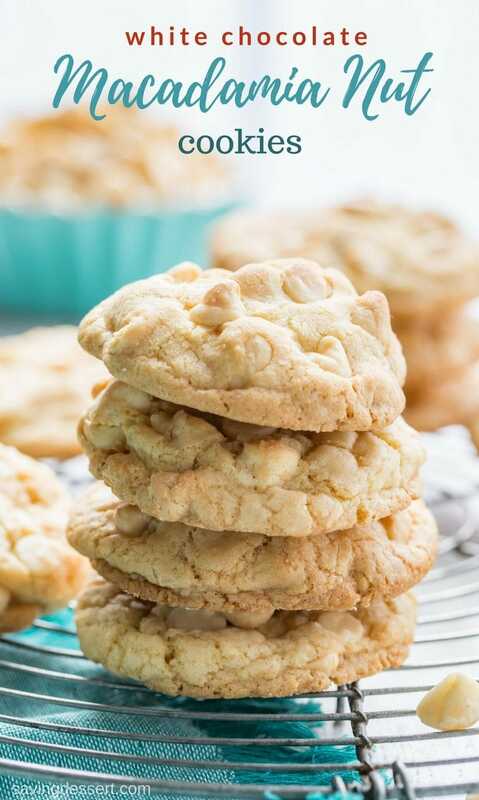 Click HERE to get the recipe for White Chocolate Macadamia Nut Cookies. These are gorgeous! Pretty hard to beat sugar cookies — simple straightforward flavor that is SO satisfying. These look party-ready. Thanks! Where to purchase the rolling pin? Hi Judy – just click on the rolling pin photo and that will take you to Amazon. There are several sellers that have this rolling pin available. Some kitchen supply stores also carry this product. Good luck and thanks for the great question! Tricia, these are gorgeous. But everything you do is gorgeous. I am needing a sugar cookie recipe because my brother requested I make about 400 cookies for his wedding! Not all sugar cookies though. Do you think these would work to slice and bake? Not sure I want to do all the decorating! You are too kind Abbe! 400 cookies is a lot – you must be a great sister 🙂 I’ve never tried making these into a slice and bake cookie so I’m not sure if that will work. If you choose to roll them out and cut into shapes, remember you can freeze the cookies for months ahead of time. If you double the recipe you will get 100 cookies out of each batch. If you make one double batch each week for a month, you’ll have your 400. Unfortunately someone will need to put icing on them – haha. 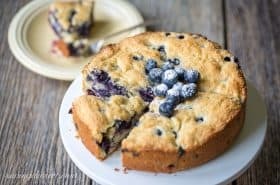 I would make a very thin glaze, set the cookies on a cooling rack over a baking pan and just pour the icing over the top. After they have dried the iced cookies should keep for 4 or 5 days. Cant’ wait to hear what you decide to do! These are just too pretty for words Tricia! They make me smile looking at them. I love that you adapted your mom’s recipe. She would have loved that! Your watering can arrangement is wonderful Tricia. So springy and beautiful! Gorgeous shots, Tricia! These are about as complicated as I care to get when decorating cookies….very doable with beautiful results!! 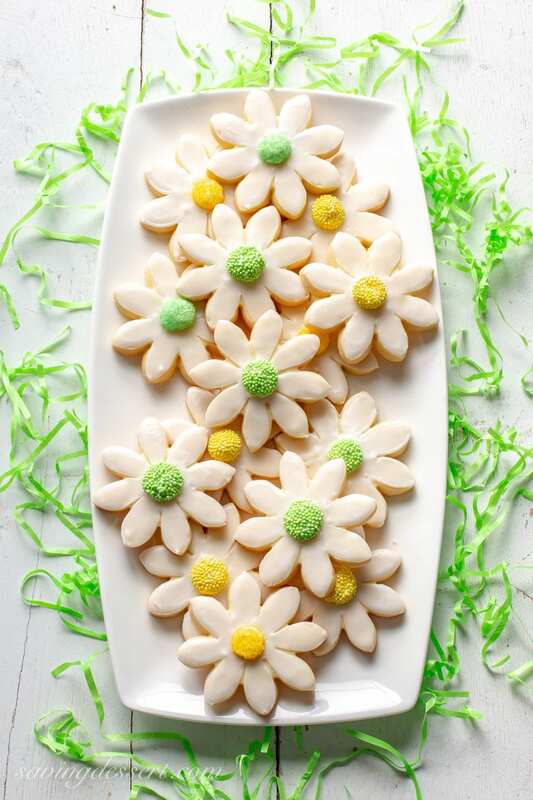 Perfect for spring and I don’t think I’d get any complaints if I made a batch for Easter! Pinned!!! 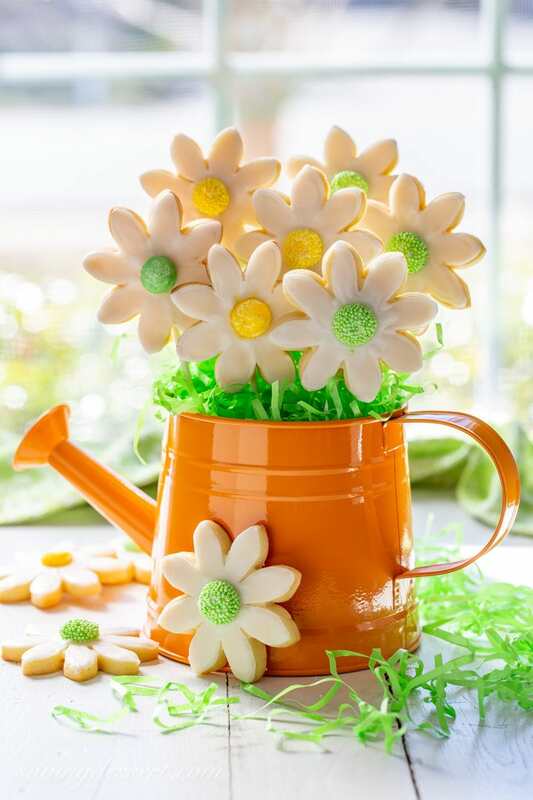 The cookies in the watering can are so cute, a great idea. I think it is funny that you had to disassemble them before your granddaughter would eat them. I can think of so many occasions when this idea would be perfect. 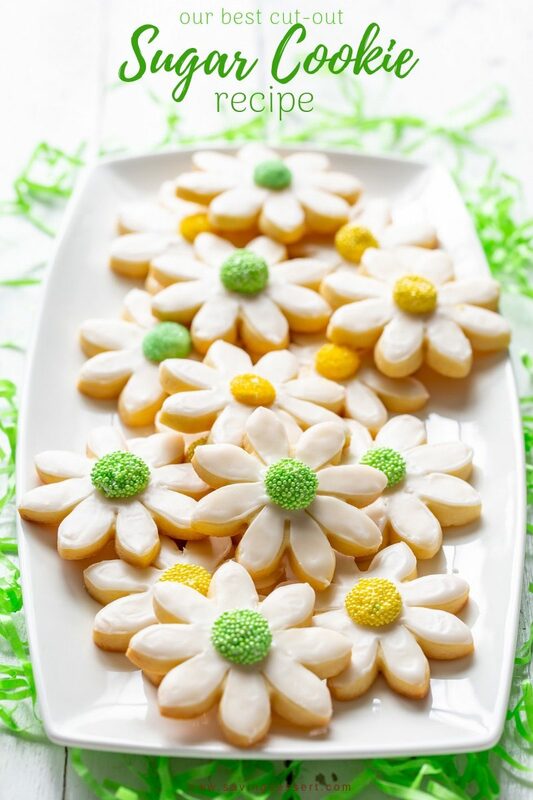 Thanks Karen – If making the flowers on the sticks again, I could make the cookie thinner and sandwich two together so the design is two sided. Or, I think I would use a sturdy pointed wooden skewer to pierce the cookie. Not sure what will work best but these were great as is. Thanks so much! Are these supposed to have salt in them? Hi Maggie. No salt added if you use salted butter. If you use unsalted butter, I would add one teaspoon. Thanks and enjoy! 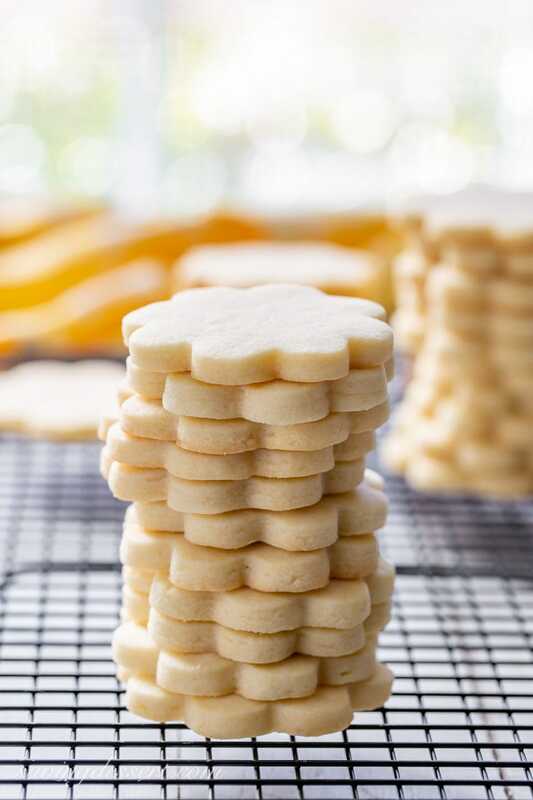 What is the texture of your sugar cookies: hard and crispy or soft and moist? Yum! 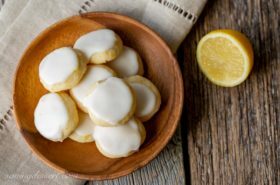 I never really loved sugar cookies until I had a real homemade sugar cookie (i.e. not out of a bag). My blogging buddy makes the best sugar cookies (well, I haven't had yours yet, so I'll say she makes the best cookies I've had so far) and she says the trick is using real butter. I need to have her make another batch soon so we can test out your Nutella cookie sandwiches. Mmmm….